15 Minute Lunch: Mr. Clean is a Giant Man-Whore. I never even noticed that before. Amazing eye you have for detail. Wow! just... wow. Glad none of those women are my wife. "just think of all the moist towelette this guy must get"
Nice to see that Mr. Clean is an equal opportunity man whore. I admit it. Mr. Clean rocks my world. I can't get enough of his Magic Eraser. I ... I'm so ashamed. You know all this time, I figured he was gay! 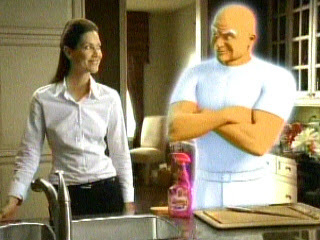 I'm not going to condone Mr. Clean's actions, but I will say he was there for me on many a lonely night. Too bad no woman can tame him. now that you mention it I like Cleanliness and I do find tall bald men in white undershirts attractive. Now I gotta go lock my doors, creepy! Do you think this says something about our respective national self images? That Mr. Muscle guy looks like Austin Powers before he became an International Man of Mystery. And dude, thanks for blowing our secret. Housecleaning will never be the same again. It was the Tidy Bowl Man that caused me concern. Down there in his tiny boat, peering up at my girly bits. Oh Mr. Muscle, I have a plughole emergency all right. JAde bunny I want to look at your girly bits. I that kind the most. wait - wasn't the tidybowl man in the tank and not the bowl? Mr. Muscle is incredible. More, I cannot, and will not, say. yeah, I'm waiting for the cease and desist order from whoever makes Mr. Clean...but so far so good. MaryBeth, you totally blew it. That's a code he has worked out with the women he visits. He is a wicked whore. I want him to come clean my kitchen! I was just reading this for some Saturday morning entertainment. It reminded me that I need to buy some Mr. Clean Magic Sponges. Thanks for the reminder. I keep forgetting. 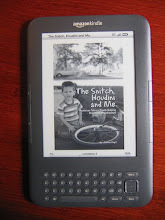 Your writing even has practical applications.